I’m relatively new to the world of quality improvement and the various terms and acronyms that are often thrown about in writing and conversation. It’s easy to become overwhelmed with jargon like LSS, GR&R, MSA, MBB, SIPOC, FMEA, kaizen, kanban, poka yoke, and others flying around when you’re starting a project. If you’re new to the discipline, I’ve found that it helps to ignore all the jargon in the beginning and resist the temptation to start filling out any tables/forms or completing any data analysis until you’ve thoroughly defined your problem and scoped the basics of your project. It’s also helpful to think about the goals of your project and how they relate to benefits the end-customer will see before jumping right into data collection and process mapping. If you’re set on starting with a structured form to guide your thinking, the Project Charter is probably your best bet, as it forces you to think broadly about your project in terms of the scope and problem/defect you’re trying to overcome. Is my problem tightly focused on one problem or issue affecting a single process, location, or service? Does my project have a proven linkage to customer needs? What are the potential benefits of my project? Can I complete this project within a reasonable time frame? Do I have the organizational resources and support I need to complete this project? Once you’re confident that you have a well-defined problem statement, a well-scoped project, and your organization’s commitment to provide necessary resources, you can proceed with choosing your project-based methodology. Ask yourself what kind of project methodology will work best for your particular problem. Whether you’re using DMAIC, DMADV, DFSS or another methodology, take advantage of the steps outlined in the method to help keep your project on task. 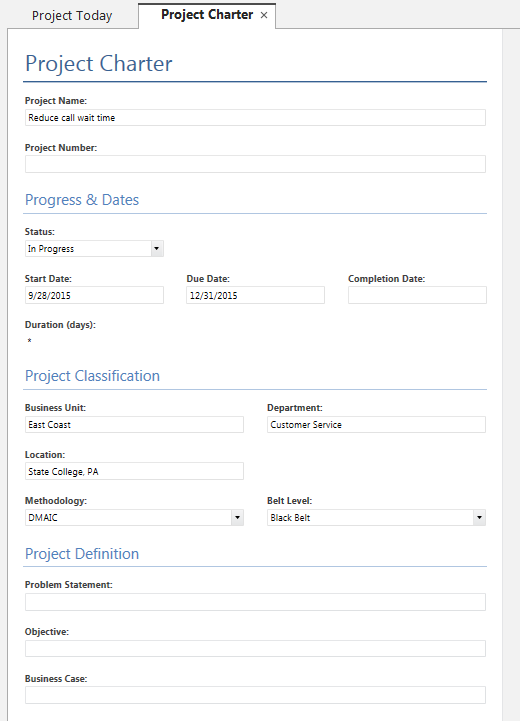 With so much to think about when you’re beginning an improvement project, Companion makes things easier by providing a Project Roadmap template for the popular DMAIC (Define, Measure, Analyze, Improve, & Control) methodology, for Kaizen, QFD, CDOV, PDCA, and Just Do It projects. 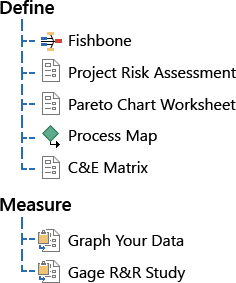 It’s also very easy to customize roadmaps to reflect your company’s unique methodology. 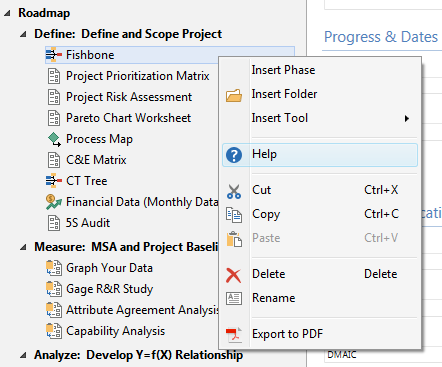 Each tool or form you use within Companion has a help topic associated with it, which can be easily accessed by right-clicking on the tool once you have it selected:. You can also access the online Help for Companion, which includes getting started guides, videos, how-to’s, an interactive glossary, and more. Remember, you don’t have to be a Six Sigma Master Black Belt or advanced statistician to complete a successful quality improvement project. A thoroughly defined problem and well-scoped project is often half the battle. Keep quality improvement simple by remembering to think about these things before diving into the more advanced steps of your project. What are your tips for simplifying quality improvement projects?